DISC Index - Personal Assessment The DISC Index™ (DI) is a personal assessment instrument designed to help individuals identify and understand their unique behavioral preferences. It is modern interpretation by Innermetrix, Inc. of the foundational work of Dr. William Marston in the field of behavioral science. The DI helps people better understand their individual behavioral strengths and tendencies, and can help them become more effective in several important areas of life including interpersonal communication, goal achievement, role development, job selection and the optimization of personal potential. Recently conducted research indicates that the most successful people share the common attribute of self-awareness. They know their strengths and recognize the types of situations that will tend to make them successful. This knowledge gives them the ability to focus on achieving objectives that best fit their individual behavioral style. They also understand their limitations and those conditions where they are less likely to be successful, and this awareness helps them recognize situations and activities they would be wise to avoid. People who understand their natural behavioral preferences are far more likely to pursue the right opportunities, in the right way, at the right time, thereby getting the results they desire. Decisiveness (D): People who score high in the “D” dimension tend to be very active in dealing with problems and challenges, while low “D” individuals tend to want to do more analysis and research before making a decision. High “D” people are described as being demanding, forceful, driving and determined. Low “D” score describe people who are conservative, cooperative, modest and agreeable. Interactiveness (I): People with high “I” scores influence others talk and action, and tend to be emotional. They are described as magnetic, warm, enthusiastic and persuasive. Those with low “I” scores influence more through data and facts. They are described as being calculating, skeptical, logical and critical. Stability (S): High “S” scores reflect someone who prefers a steady pace and does not like sudden change. Such individuals are calm, patient, deliberate and consistent. Low “S” people are seen as liking change and variety, and are usually described as restless, impatient, eager, or even impulsive. Caution “C”: Individuals who are characterized as high “C” prefer to adhere to rules, regulations and order. They like to do quality work and want to do it right the first time. They are usually careful, neat, systematic and tactful. Those with low “C” styles like to challenge rules and act independently of them. They may be perceived as stubborn, opinionated, unsympathetic, rebellious and perhaps, even careless. 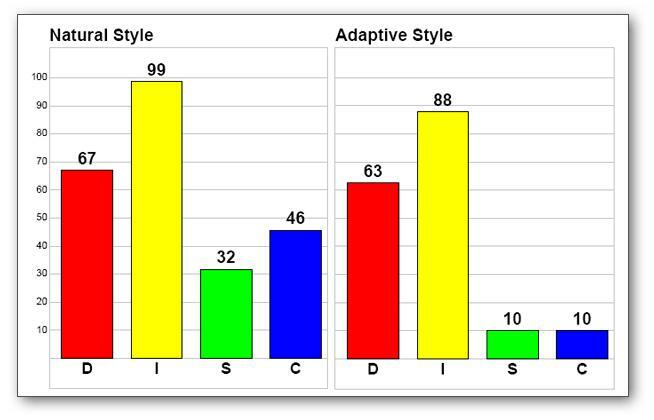 According to Marston, each person has two behavioral styles; how they naturally tend to behave (natural style) and how they perceive they should modify their natural tendencies (adaptive style). The Natural Graph depicts the natural self or how people cope with the environment under stress or pressure. It is how a person would prefer to behave if they were allowed to be themselves. Ideally, the dimensional levels represented by the natural graph would be well aligned with the person's environment – allowing them to be as authentic as possible. The Adaptive Graph reflects how people act in order to meet the expectations of others in their present environment. More correctly, this is how they perceive they must change to better fit their environment. One way to look at the Adaptive graph is as the "role" that people behaviorally assume when attempting to meet what they feel are the expectations of others or their surroundings. If the natural and adaptive graphs are nearly the same the person is not assuming any "role" or feeling as if they need to change who they are. They are basically saying, "This is who I am and that's just fine." If the two graphs differ significantly, the person feels considerable need or pressure to change their behavior. The impetus for change can come from either internal or external sources (e.g., what others have told you or your own internal desire to be something else).